Recently, I’ve been reading about mentor texts, books writers can study to learn about some aspect of writing. If you are writing historic fiction make The Caged Graves by Dianne K. Salerni your mentor text. It is the story of 17-year-old Verity Boone. After moving away when she was a toddler, Verity returns to Catawissa, PA. in 1867. She has been corresponding with a young farmer and they plan to get married. 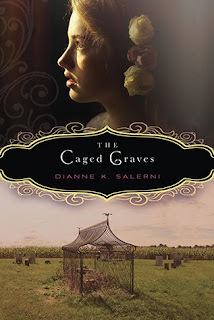 In Catawissa, she discovers two caged graves located outside the church cemetery. Since one of the graves is her mother’s, Verity is determined to find out what happened 15 years earlier and why no one will speak about it. It’s clear from the start that Salerni has done her research. She knows what you would eat at an ordinary meal vs. a celebration. She knows what dry goods Verity could buy in Catawissa and what she would order as well as what plants women used to doctor what ailments. She even knows what magazine a woman would show her future daughter-in-law when picking out things for a wedding. Salerni gently worked in these details throughout the story. Historic fiction gone wrong often substitutes research for story. Salerni, on the other hand, gives the reader a layered plot, sure to satisfy. First comes the mystery plotline. What happened 15 years ago and why will no one speak about it? Then she layers in the romance, complete with one love triangle and hints of other possibilities. Will Verity marry the man she planned to marry or will a new suitor win her heart? And what if another girl, someone he’s known since childhood manages to turn her beau’s head? Salerni also pulls in a treasure hunt and possible paranormal activity. The resulting plot is marvelously complicated and rich and could take place in no other setting. And that’s the last thing that Salerni pulls off. She has woven the setting so deeply into this story that it could take place no-where and no-when else and she does it in a way that it completely unique. Given this particular setting, that’s saying something. The story takes place post-Civil War so I went into it with certain expectations. I expected something to do with conflict between northern and southern sympathizers or slavery. Neither is even mentioned. Instead, Salerni focuses on another reality of the Civil War, men who had the means to pay a poor man to fight in their place and other men who might have escaped the conflict if their family hadn’t needed the money. This is vital to the plot, because the war has created a shortage of uninjured men. Time and place feed directly into Salerni’s story. Salerni shows what can be done when an author combines detailed research with a winning story set in the one and only place and time it could happen. Read and learn, ladies. Read and learn. Sue will be teaching one of our courses, Writing Nonfiction for Children and Young Adults, starting October 7, 2013. Sue: Is this young adult? Just curious. It sounds AWESOME! It is so hard to weave those details of nonfiction in while staying true to your story, which is what historical fiction is all about. Thanks for sharing this book and her skill with us! It is YA, but I also think it would appeal to adults. The story is complex enough. Sounds great, Sue! I'll definitely be checking this one out.